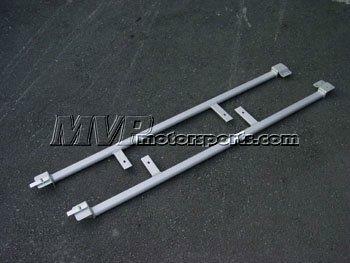 This application is designed to stiffen the chassis for front to back movement. While strut bars stiffen the chassis for left to right movement, the genuine Do-Luck Steel Floor Support Bars assist with stiffening the chassis for hard acceleration and braking. They attach underneath your car on each side of it, basically between your front & rear tire.